German Shepherd - sleep outside? You need to make the decision for him. German Shepherds are very intelligent and very social and do so much better when raised as indoor pets. 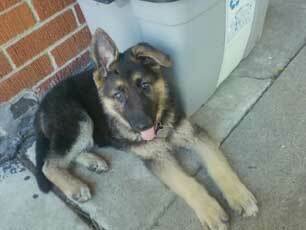 So do yourself, and your German Shepherd puppy, a favor and teach that puppy to enjoy his crate. And his home indoors with you. Good luck - and here's more info on crate training if you need it too.